While in Tokyo for CEATEC, I made the pilgrimage to Casio headquarters and geeked out at their museum. I saw the world's first electronic calculator (about the size of a toaster oven) and also the first digital camera with—if you can believe it—an LCD screen on the back. But my real purpose was to meet with the father of that old camera, Jin Nakayama, to see his latest offspring. It's so new, in fact, they haven’t chosen a name yet. But it’s the wildest camera I've ever seen. By mating a high-performance CMOS image sensor with a new, lightening-fast processor, the camera can shoot up to 60 (yes, 60) six-megapixel photos per second or—get this—300 video frames per second. That’s National Geographic-style slow-mo video from a consumer camera. 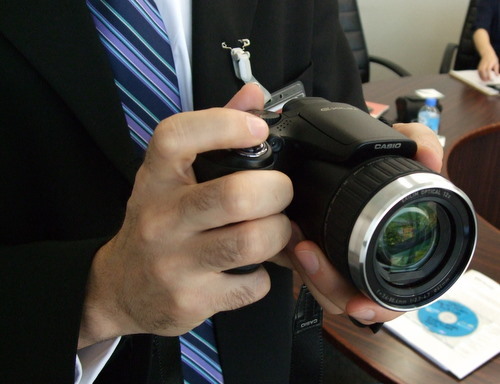 Well, if Casio goes ahead and builds a consumer camera. For now, it’s just a science experiment. But the prototype I saw looks pretty darn close to a real product. do you have a video to upload? 10x slo-mo would be awesome on a consumer camera. Okay, sign me up. Every physics teacher in the US will want one of these as well. Any idea at a possible time frame for release and/or MRP? I want one now more than I want an upgrade to my Nikon D70s. @ Just Another Engineer, it is expected to be released in March 2008, with a list price of $1000 (one thousand dollars). The Japanese sites report a starting monthly production output of 10,000 units, so we could have some an interesting supply/demand situation if the early reviews are positive. Life is not fair, get used to it.Flipping burgers is not beneath your dignity. Your grandparents had a different word for burger flipping; they called it opportunity. true religion man's jean see a variety of options for men in terms of colors, material textures and designs. They come in both earthy as well as flamboyant tones, with prints such as the famous skull prints, love hearts etc inspired by the tattoo designs. In fact many of these jeans also sport embroidery of tattoo designs and this provides a very trendy look! With these patterns differing across products, some jeans have them all over, others just on the front or only on pockets etc. true religion joey jeans ensures that these jeans don't just look good but fit good as well and that solves more than half the problem for men! What is left is the price. Lets look at why wholesale can be a better option. You would probably agree that men don't go shopping for clothes as often as women do, and the clothes men buy are definitely priced higher than those for women. Buying Ed Hardy jeans in wholesale provides two things for you, one is the price falls and you save considerably on money and two your wardrobe is stocked with variety for some time to come. Wholesale shopping can inspire the best in quality and price as the shop keeper is extra sure to please a customer wanting to buy bulk stock. Wholesale shopping of true religion cotton jeans is also a great option if you want to gift your dear and dear, both family and friends. Buy great style and the best prices and then comes the party, with Ed Hardy! This is my first time i visit here. I found so many entertaining stuff in your blog, especially its discussion. From the tons of comments on your articles, I guess I am not the only one having all the enjoyment here! Keep up the excellent work. For now, it’s just a science experiment. But the prototype I saw looks pretty darn close to a real product. Good job.No matter where we are, we must study all the way. As the proverb says that: You are never too old to learn. Thank you for your blog. To fail to attend or perform: never missed a day of work. Thank you for your post, I look for such article along time,today i find it finally.this postgive me lots of advise it is very useful for me .i will pay more attention to you ,i hope you can go on posting more such post, i will support you all the time. Wow…I am bowled by your level of knowledge. I am so impressed. I think you have got a deep insight into this topic. Could not think on those lines ever…I think you are gifted…keep going. Thumbs up! Just don’t be overwhelmed after reading my comment but I simply could not stop myself from appreciating this wonderful piece of marvel. What a blog…it traverses you to a whole new progressive world. Coooollll… do you really think this is the truth. I always thought it this way however since nobody agreed I could not further on this topic. Great man, I appreciate the work you have done. I completely share your view points when it comes to this topic. I thought I was the alone who maneuver such a thinking process. But yeah finally I have got a company. Let’s search more on this and share over her. What say?? true religion joey jeans ensures that these jeans don't just look good but fit good as well and that solves more than half the problem for men! What is left is the price. Lets look at why wholesale can be a better option. Thank you very much for keeping me up to date. Remember, those in your life care about who you are, not what you do. A big match for other dlsr camera. I like to have it as one of my collections.